Soon to start work again. In about a week it is time to start work again and i have no idea what projects to go for. Have been using the summer to try out some new things but nothing really sticks. And I have working on some new theme for the paintings and struck out big time. Looks like to try to paint not really my thing anymore. The search for Spock continues. There are many interesting projects both in art and in VR but cant really get in to it. Have been working on some facebook project, playing games and working in the studio. Reading a lot and generally walking around the garden. No luck. Hard to see what will come of it all. But something have to happen. Blogging from my phone and i am really bad at this. Need to buy keyboard, summer time. Read more: On vacation in RL. OSg7b, Talented builders, outdated graphics. Read more: OSg7b, Talented builders, outdated graphics. Time for snowy woods in Lendonia. Read more: Time for snowy woods in Lendonia. Never heard of wigglegram before but I found them on the web of course. That’s something to test before the Oculus Rift arrives. The new virtual world. Just a box. 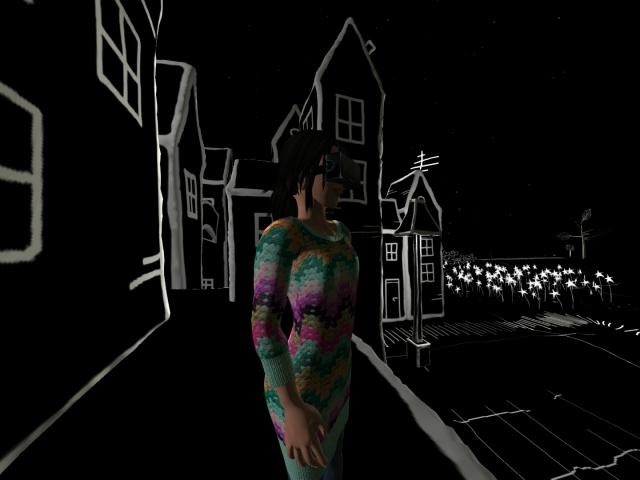 Read more: The new virtual world. Just a box. It is hot and i am not good at that. So i am indoors writing and visiting new places. Nothing much to do today so I decided to check out the cloud based Opensim worlds called Kitely http://www.kitely.com . I took a break. Just sitting overlooking my Second life. So what´s new. Sometimes you find strange places. Travel to find nice and strange places. I am not saying anything about it you just have to go and visit. No words. Read more: Sometimes you find strange places. Got a new tan in SL, originally uploaded by cyberserenity Vella. I want to live in a teapot. I want to live in a teapot., originally uploaded by cyberserenity Vella. Read more: I want to live in a teapot. Role playing?, originally uploaded by cyberserenity Vella. Exploring Steeltopia, originally uploaded by cyberserenity Vella. Dark places, originally uploaded by cyberserenity Vella. Nice photo at Tricia Aferdita Gallery, originally uploaded by cyberserenity Vella. Have not been partying for a long time but really i am back Hated that Des Les disappeared.but you just have to find new places. So look out i am back. Out doors it looks like this. Thats why i am doing this. Having fun with Second life photography. Read more: Having fun with Second life photography. Really nice experimental shadows. When you have started you just do not want to be without them. But of course they crash my viewer all the time. The new Nils art gallery. Read more: The new Nils art gallery. New openSUSE and new Opensim servers finally. Read more: New openSUSE and new Opensim servers finally. Read more: More RL animals. Read more: Still on vacation. So its summer in Sweden and i am having a nice vacation. In the rain. But i expect to get some sun soon.